McShane, P. E. (1995). Effects of sea-based farming of paua (Haliotis spp.) and kina (Evechinus chloroticus). Report to N.Z. Department of Conservation. 15p. McShane, P. E. (1996). Wairoa Taiwhenua Fishing Venture: Project assessment prepared for the N.Z. Foundation for Research, Science and Technology. 7 p.
McShane, P. E. (1998). Risk Assessment and Harvest Strategy Evaluation for the Victorian Abalone Fishery. Report to the Abalone Committee of the Victorian Fishing Industry Federation. 5 p.
McShane, P. (1998). Transfer of by-catch reduction technology to South Australian prawn fisheries. Final report to FRDC. Project No. 96/254.02. 15 p.
McShane, P. and R. Lenanton (1999). A review of research programs in support of the South Australian Marine Scalefish Fishery. Report to Primary Industry and Resources South Australia (Fisheries and Aquaculture). 64 p.
McShane, P. (2001). Research and development priority setting for the South Australian Seafood Industry. Report to the South Australian Fisheries Research Advisory Board, July 2001. 43p. McShane, P. (2002). Research and Development: a review of its application in the South east trawl fishery. Report to the South east trawl fishery Industry Association and FRDC. March, 2002. 36p. McShane, P. (2003). Scientific data gathering − training issues. In “A workshop to investigate the development of training and accreditation procedures for the provision of scientific data by the fishing industry”. Smith, A.D.M. Report to FRDC 2000/304. ISBN 1 876996 42 0. pp 35−38. McShane, P. E. (2004). Making the most of training and education opportunities for the Australian Aquaculture Industry. Report to Department of Agriculture Fisheries and Forestry, June 2004. 220pp. McShane, P. E. (2004). Proactive environmental management of commercial fisheries − supply chain management of the S. A. rock lobster industry. Final report to Department of Agriculture Fisheries and Forestry June 2004. McShane, P. E. (2004). Proactive environmental management of commercial fisheries: closing gaps in supply chain management. Final report to FRDC SIDF 2002/434. McShane, P. E. (2006). Langkawi yellowfin tuna aquaculture: a report on proposed site suitability for the purpose. Report to SRM Malaysia. (July 2006). AMSAT (2007). Scoping study on the strengthening and capacity building of fish quarantine in Indonesia. Report to Australian Government Department of Agriculture Fisheries and Forestry. 17p. AMSAT (2007). Scoping study on the strengthening and capacity building of fish quarantine in Indonesia: Part 2. Australia’s capacity to assist. Report to Australian Government Department of Agriculture Fisheries and Forestry. 43. pp. McShane, P. , Muggleton, M, Edwards, R. (2007). Integrated supply chain management as a strategy to niche market development. Report to Australian Government Department of Agriculture Fisheries and Forestry Industry Action Partnership program. McShane, P. E. (2008). Kupang Fishery Ecoport development. Strengthening Indonesia’s use of Ecologically Sustainable approaches to Port Development. Activity completion report to AusAID. 40 pp. AMSAT (2008). Strengthening of food inspection and certification for shrimp and bivalve molluscs in ASEAN. Implementation strategy and Operational Guidelines. Report to ASEAN-Australia Development Cooperation Program. Regional Partnerships Scheme. 23 pp. AMSAT (2008). Strengthening of food inspection and certification for shrimp and bivalve molluscs in ASEAN. Situation analysis report. Report to ASEAN-Australia Development Cooperation Program. Regional Partnerships Scheme. 16 pp. AMSAT (2008). Strengthening of food inspection and certification for shrimp and bivalve molluscs in ASEAN. Feasibility of a product management system. Report to ASEAN-Australia Development Cooperation Program. Regional Partnerships Scheme. 16 pp. Knuckey, I, Calogeras, C. and McShane, P. (2008). Empowering stakeholders to initiate and advance R&D projects in the seafood industry. Final report to FRDC project 2007/304. Hicks, M., McShane, P., and Edwards, R. (2008). Developing quality standards for the Queensland Trawl industry as part of a pathway towards an integrated clean and green promotional strategy. Final Report to FRDC Project 2008/205. McShane, P. (2009) Evaluating co-management opportunities for the Spencer Gulf prawn fishery. Discussion paper for the Spencer Gulf Prawn Fishermans Association for FRDC project 2007/025. 18 pp. 25 pp. McShane, P., Hollamby, K., Sloan, S., and Brook, J. (2009). A preferred co-management model for the Spencer Gulf prawn fishery. Discussion paper for the Spencer Gulf Prawn Fishermans Association for FRDC project 2007/025. 18 pp. Hollamby, K. L., McShane, P. E., Sloan, S. and Brook, J. (2010). Competition to collaboration: exploring co-management models for the Spencer Gulf prawn fishery. Final report to FRDC project 2007/025. McShane, P. E. (2010). Developing integrated catchment management strategies for sustainable water use in response to climate change. AusAID Public Sector Linkage Program Activity Completion Report ROU Number 49819. McShane, P. E. (2010). Developing integrated catchment management strategies for sustainable water use in response to climate change. AusAID Public Sector Linkage Program Activity Completion Report ROU Number 49196. McShane, P. E. (2011). Developing capacity for proactive climate change mitigation and adaptation. AusAID Public Sector Linkage Program Activity Completion Report ROU Number 52163. McShane, P. E. (2011). Strengthening capacity for proactive climate change policy development and application. AusAID Public Sector Linkage Program Activity Completion Report ROU Number 52165. McShane, P. E. (2011). Developing integrated catchment management strategies for sustainable water use in response to climate change. AusAID Public Sector Linkage Program Activity Completion Report ROU Number 50467. McShane, P. E. (2011). International river management in response to climate change. AusAID Australian Leadership Award Fellowship Activity Completion Report ROU Number 54994. McShane, P. E. (2012). Managing community impacts of climate change in India and Bangladesh. AusAID Public Sector Linkage Program Activity Completion Report ROU Number 54565. McShane, P. E. (2012). Extending successful community-based forest management experience for application in REDD scheme reforestation trials and development of an Asian carbon economy. AusAID Public Sector Linkage Program Activity Completion Report ROU Number 54356. McShane, P. E. (2012). Developing research capacity for sustainable development in response to climate change. Australian Leadership Award Fellowship Activity Completion Report ROU Number 62735. McShane, P. E. (2013). Research capacity building, community development and peatland conservation in Central Kalimantan. Report to Aurecon IDSS for AusAID Kalimantan Forests and Climate Partnership (KFCP) CF 130538. McShane, P. E. (2013). Developing effective climate change (adaptation and mitigation) policy in Vietnam. AusAID Public Sector Linkage Program Activity Completion Report ROU Number 62151. McShane, P. E. (2013). Knowledge sector development Vietnam. Australian Leadership Award Fellowship Activity Completion Report ROU Number 65152. McShane, P. E., Aarons, J., and Chan, T. (2013). South-south knowledge sharing for ecosystem-based adaptation. Community-based approaches to climate change adaptation: knowledge transfer among climate-exposed countries. Final report to the World Bank Group (Climate Policy and Finance Department). McShane, P. E. (2014). Community engagement for improved outcomes HIV/AIDS and maternal health, Myanmar. Australian Awards Fellowship. Activity Completion Report R14-0003-1549879. McShane, P. E. (2015). Overcoming barriers to building Indonesia’s missing SME segment. Australia Awards Fellowship. Activity Completion Report R150665-168645. Griggs, D., McShane, P., and Smith, L. (2015). Evaluating the environmental plan for Ar Riyadh city, Saudi Arabia. Final report to the ArRiyadh Development Authority. McShane, P. E. (2015). Sustainable Fisheries Management for Indonesia. Australia Awards Indonesia. Activity Completion Course, Short Course 1. McShane, P. E. (2016). Sustainable Fisheries Management for Indonesia. Australia Awards Indonesia. Activity Completion Report, Short Course 2. McShane, P. E. (2016). Seafood Product Development Indonesia. Australia Awards Indonesia. Activity Completion Report. McShane, P. E. (2016). Empowering women for sustainable development of Indonesia’s aquatic living resources. Activity Completion Report, Australia Awards Fellowship. McShane, P. E. (2017). Developing capacity for sustainable economic development of Indonesia’s fisheries. Activity Completion Report, Australia Awards Fellowship. McShane, P. E. (2017). Developing translating and interpreting services for improved governance in Indonesia. Activity Completion Report, Australia Awards Fellowship. McShane, P. E. (2018). Sustainable Aquaculture Indonesia. Activity Completion Report. Australia Awards Indonesia. McShane, P. E. and M. G. Smith (1986). Starfish vs abalone in Port Phillip Bay. Australian Fisheries 45, 16−18. McShane, P. E., K. H. H. Beinssen, M. G. Smith, S. O’Connor and N. J. Hickman (1986). Reproductive biology of blacklip abalone Haliotis ruber from four Victorian populations. Victorian Ministry for Conservation, Forests and Lands, Marine Science Laboratories, Technical Report No. 55. McShane, P. E., K. H. H. Beinssen and S. Foley (1986). Abalone reefs in Victoria – a resource atlas. Victorian Ministry for Conservation, Forests and Lands, Marine Science Laboratories, Technical Report No. 47. McShane, P. E. (1988). World developments in abalone culture. In, Australian Shellfish Aquaculture conference Proceedings. 1st Australian Shellfish Aquaculture conference: 1988: Perth, Australia, pp 212−223. McShane, P. E. (1988). Tagging abalone. In Proceedings of workshop on tagging. ed. D.A. Hancock. Aust. Govt. Publ. Serv., Canberra, pp 65−68. McShane, P. E., M. G. Smith and K. H .H. Beinssen (1988). Growth and morphometry in abalone (Haliotis rubra) from Victoria Australian Journal of Marine and Freshwater Research 39, 161−166. McShane, P. E. and M. G. Smith (1988). Measuring abundance of juvenile abalone Haliotis rubra Leach Gastropoda:Haliotidae) – comparison of a novel method with two other methods. Australian Journal of Marine and Freshwater Research 39, 331−336. McShane, P. E., K. P. Black and M. G. Smith (1988). Recruitment processes in Haliotis rubra (Mollusca:Gastropoda) and regional hydrodynamics in southeast Australia imply localised dispersal of larvae. Journal of Experimental Marine Biology and Ecology 124, 175−203. McShane, P. E. (1988). Developments in abalone culture. AustAsia Aquaculture 3, 5 − 8. McShane, P. E. and M. G. Smith (1989). Direct measurement of fishing mortality in abalone (Haliotis rubra) off southeastern Australia. Fisheries Research 8, 93−102. McShane, P. E. and M. G. Smith (1991). Recruitment variation in sympatric populations of Haliotis rubra (Mollusca:Gastropoda). Marine Ecology Progress Series 73, 203−210. McShane, P. E. (1991). Density-dependent mortality of recruits of the abalone Haliotis rubra (Mollusca:Gastropoda). Marine Biology 110, 385−389. McShane, P. E., S. Mercer and R. Naylor (1992). Surveys of southern stocks of paua. Professional Fisherman (N.Z.) 6 (3), 29−33. McShane, P. E. (1992). Early life history of abalone. In, Abalone of the world: biology, fisheries and culture, edited by S. A. Shepherd, M. J. Tegner and S. A. Guzman del Proo, Blackwells, Oxford. pp 120−138. McShane, P. E., S. Mercer and R. Naylor (1992). Surveys of Marlborough stocks of paua. Professional Fisherman (N.Z.) 6 (10), 34 −38. McShane, P. E. and M. G. Smith (1992). Shell growth checks are unreliable indicators of age of the abalone Haliotis rubra (Mollusca:Gastropoda). Australian Journal of Marine and Freshwater Research 43, 1215−1219. McShane, P. E. (1992). Exploitation models and catch statistics of the Victorian fishery for abalone Haliotis rubra. Fishery Bulletin 90, 139−146. McShane, P. E. (1992). Paua fishery assessment 1992. New Zealand Fisheries Assessment Research Document 92/3, 26 p.
McShane, P. E. and I. A. Knuckey (1992). Developments in mariculture of abalone (Gastropoda:Haliotidae) in Victoria, Australia. Victorian Ministry for Conservation, Forests and Lands, Marine Science Laboratories, Technical Report No. 00. McShane, P. E. (1993). Abasim – a graphic fishery. Book review. New Zealand Journal of Marine and Freshwater Research 27, 276−277. McShane, P. E., S. Mercer and R. Naylor (1993). Paua and kina off D’Urville Island. Seafood New Zealand 1 (2), 53−55. McShane, P. E. (1993). Experimental fishing for paua − west coast, south island (PAU 6). Seafood New Zealand 1 (3), 41− 42. McShane, P. E. and S. Mercer (1993). Surveys of paua stocks−west coast, south island (PAU 6). Seafood New Zealand 1 (4), 36−38. McShane, P. E. (1993). Evidence for localised recruitment failure in the abalone Haliotis iris (Mollusca:Gastropoda). In, C. N. Battershill et al. (eds.). Proceedings of the Second International Temperate Reefs Symposium, 7-10 January, Auckland, New Zealand. NIWA Marine, Wellington. pp 145−150. McShane, P. E. , P. Notman, J. Kapa and R. Welsh (1994). Surveys of paua stocks – west coast, south island (northern part). Seafood New Zealand 2 (1), 57−58. McShane, P. E. (1994). Paua stock assessment−a critical view. Seafood New Zealand 2 (2), 26−29. McShane, P. E. (1994). Successful abalone conference held in Hobart. Seafood New Zealand 2 (3), 44−45. McShane, P. E., S. Mercer, J. R. Naylor and P. R. Notman (1994). Paua (Haliotis iris) fishery assessment 1994. New Zealand Fisheries Assessment Research Document 94/16, 47 p.
McShane, P. E., S. Mercer and R. Naylor (1994). Surveys off the Otago coast and studies of stunted stocks. Seafood New Zealand 2 (5), 34−36. McShane, P. E., P. Notman and J. Kapa (1994). Experimental fishery for paua starts: PAU 6. Seafood New Zealand 2 (6), 33−35. McShane, P. E., S. Mercer and R. Naylor (1994). Paua surveys− Chatham Islands. Seafood New Zealand 2 (7), 35−37. McShane, P. E., S. Mercer and R. Naylor (1994). Yellow foot paua; biology, fishery and aquaculture. Seafood New Zealand 2 (8), 37−39. McShane, P. E., H. K. Gorfine and I. A. Knuckey (1994). Factors affecting food selection in the abalone Haliotis rubra (Mollusca:Gastropoda). Journal of Experimental Marine Biology and Ecology 176, 27−37. McShane, P. E. (1994). Estimating the abundance of stocks of abalone (Haliotis spp.) − examples from Victoria and New Zealand. Fisheries Research 19, 379−394. McShane, P. E. , S. F. Mercer and J. R. Naylor (1994). Spatial variation and commercial fishing of New Zealand abalone (Haliotis iris and H. australis). New Zealand Journal of Marine and Freshwater Research 28, 345−355. McShane, P. E., D. R. Schiel, S. F. Mercer and T. Murray (1994). Morphometric variation in Haliotis iris (Mollusca: Gastropoda): analysis of 61 populations. New Zealand Journal of Marine and Freshwater Research 28, 357−364. McShane, P. E. (1994). Experimental fishing for abalone, southwest New Zealand. Abalone News 6 (3), 10. McShane, P. E. and R. Naylor (1994). The biology of paua: reproduction and early life. Seafood New Zealand 2 (10), 28−29. McShane, P. E. and R. Naylor (1994). The biology of paua: growth and survival. Seafood New Zealand 2 (11), 44−46. McShane, P. E. and J. R. Naylor (1995). Depth can affect post-settlement survival of Haliotis iris (Mollusca: Gastropoda). Journal of Experimental Marine Biology and Ecology 187, 1−12. McShane, P. E. and J. R. Naylor (1995). Density independent growth of Haliotis iris (Mollusca:Gastropoda). Journal of Experimental Marine Biology and Ecology 190, 51−60. McShane, P. E. (1995). Recruitment variation in abalone: its importance to fisheries management. Marine and Freshwater Research 46, 555−570. McShane, P. E. (1995). Estimating the abundance of abalone: the importance of patch size. Marine and Freshwater Research 46, 657−662. McShane, P. E., S. Mercer, and R. Naylor. (1995). Good settlement of paua in PAU 7. Seafood New Zealand 3 (6), 20−21. McShane, P. E., P. Notman, P. Gerring, and J. Kapa. (1996). PAU 6. Seafood New Zealand 4 (2), 30−31. McShane, P. E. (1996). Reseeding paua. Seafood New Zealand 4 (8), 34−35. McShane, P. E. (1996). Abalone symposium a great success Seafood New Zealand 4 (11), 32−36. McShane, P. E. (1996). Paua farming: the focus of a successful symposium in Wellington. Aquaculture Update 16, 1−2. McShane, P. E. and J. R. Naylor (1995). Small-scale spatial variation in growth, size at maturity, and yield- and egg-per-recruit relations in the New Zealand abalone (Haliotis iris). New Zealand Journal of Marine and Freshwater Research 29, 601−609. McShane, P. E. (1996). Patch dynamics and exploitation of abalone (Haliotis iris) populations. Fisheries Research 25, 191−199. McShane, P. E., S. Mercer, J. R. Naylor and P. R. Notman (1996). Paua (Haliotis iris) fishery assessment in PAU 5, 6, and 7. New Zealand Fisheries Assessment Research Document 96/11, 30 p.
McShane, P. E. (1996). Recruitment processes in abalone (Haliotis spp.). In, Y. Watanabe, Y. Yamashita, Y. Oozeki (eds). Survival strategies in early life stages of marine resources. Proceedings International workshop, Yokohama, 11−14 October 1994, Balkema Rotterdam. pp. 107−116. King, R. H., C. J. Rayner, M. Kerr, H. K. Gorfine and P. E. McShane (1996). The composition and amino acid balance of abalone (Haliotis rubra) tissue. Aquaculture 140, 109−113. McShane, P. E. and J. R. Naylor (1996). Variation in spawning and recruitment of Haliotis iris (Mollusca:Gastropoda). New Zealand Journal of Marine and Freshwater Research 30, 327−334. McShane, P. E. and J. R. Naylor (1997). Direct estimation of natural mortality of the New Zealand abalone Haliotis iris. New Zealand Journal of Marine and Freshwater Research 31, 143−145. Naylor, J. R., P. E. McShane, P. Notman, R. I. C. C. Francis. (1997). The experimental fishery for paua in PAU 6. Report to Ministry of Fisheries Wellington, NIWA, Wellington. 16 p.
Naylor, J. R. and P. E. McShane (1997). Predation by polychaete worms on larval and post-settlement abalone Haliotis iris (Mollusca:Gastropoda). Journal of Experimental Marine Biology and Ecology 214, 283–290. Naylor, J. R. and P. E. McShane (1997). Post-settlement survival of abalone (Haliotis iris, H. australis) in turbulent flows. Molluscan Research 18, 227–232. McShane, P. E. (1997). Differences in the relative abundance of abalone (Haliotis iris) in relation to the perceived status of two regional fisheries in New Zealand. Molluscan Research 18, 161–168. Shepherd, S. A. and P. E. McShane (1997). The Australasian symposium on abalone fisheries, culture and biology. Wellington, New Zealand, October 1996. Introduction. Molluscan Research 18, 1–2. McShane, P. E. (1998). Assessing stocks of abalone (Haliotis spp. ): methods and constraints. In Proceedings of the North Pacific Symposium on Invertebrate Stock Assessment and Management. Edited by G. S. Jamieson and A. Campbell. Canadian Special Publication Fisheries and Aquatic Science 125, 41−48. Wells R. M. G., P. E. McShane, N. Ling, R. J. Wong, T. O. C. Lee, and J. Baldwin (1998). Effect of wave action on muscle metabolism and growth indices in the New Zealand abalone (Haliotis iris). Comparative Biochemistry and Physiology 119B, 129−136. McShane, P. E. (1999). Blacklip abalone. In N. L. Andrew (ed.). Under Southern Seas: the ecology of Australia’s rocky reefs. Pp. 72−78. UNSW Press, Sydney. Naylor, J. R., and P. E McShane (2001). Incidental mortality of post-settlement abalone Haliotis iris (Mollusca:Gastropoda) caused by conspecific adults and wave exposure. New Zealand Journal of Marine and Freshwater Research 35, 363−369. McShane, P. E. (2001). Ecological consequences of abalone fishing. In National Abalone Convention Proceedings. pp 133−137. Fisheries Research and Development Corporation and the Abalone Industry Association of SA Inc. 2001. ISBN 0-9579967-0-5. McShane, P. E. and J. R. Naylor (1991). A survey of kina populations (Evechinus chloroticus) in Dusky Sound and Chalky Inlet, southwestern New Zealand. New Zealand Fisheries Assessment Research Document 91/17, 21p. McShane, P. E. (1992). Sea urchin fisheries of the world – prospects for development of a kina fishery in New Zealand. Professional Fisherman (N.Z.) 6 (5), 27−32. McShane, P. E., S. Mercer and R. Naylor (1992). Sea urchins in Dusky Sound – Prospects for a major Kina industry in New Zealand. Professional Fisherman (N.Z.) 6 (11), 34 −40. McShane, P. E., O. Anderson, P. Gerring, and R. Stewart (1993). Experimental fishing for sea urchins (kina) under way in Dusky Sound. Seafood New Zealand 1 (1), 42−44. McShane, P. E. and R. Naylor (1993). SUR 7 – Prospects for development of a kina fishery. Seafood New Zealand 1 (5), 33−34. McShane, P. E., J. R.Naylor, O. A. Anderson, P. Gerring and R. Stewart (1993). Pre-fishing surveys of kina (Evechinus chloroticus) in Dusky Sound, southwestern New Zealand. New Zealand Fisheries Assessment Research Document 93/8, 28 p.
McShane, P. E., R. Stewart, O. Anderson, and P. Gerring (1994). Failure of kina fishery leaves bitter taste. Seafood New Zealand 2 (4), 33−34. McShane, P. E., R. Stewart, O. Anderson and P. Gerring (1994). The biology of kina. Seafood New Zealand 2 (9), 35−36. McShane, P. E., O. Anderson, P. Gerring, R. Stewart and J. R. Naylor (1994). Fisheries biology of kina (Evechinus chloroticus). New Zealand Fisheries Assessment Research Document 94/17, 35 p.
McShane, P. E. and A. Bradbury (1995). Spatial management of sea urchin (kina) fisheries. Seafood New Zealand 3 (4), 36−37. McShane, P. E. (1997). A summary of commercial catch data and biological information for kina (Evechinus chloroticus). New Zealand Fisheries Assessment Research Document 97/16, 7 p.
McShane, P. E., P. K. Gerring, O. F. Anderson and R. A. Stewart (1996). Population differences in the reproductive biology of Evechinus chloroticus (Echinoidea: echinometridae). New Zealand Journal of Marine and Freshwater Research 30, 335−341. McShane, P. E. and O. F. Anderson (1997). Resource allocation and growth in the sea urchin Evechinus chloroticus (Echinoidea: Echinometridae). Marine Biology 128, 657-663. Keesing, J., S. Uticke, N. Andrew, W. Zacharin, H. Gorfine, M. Alma, D. Ramm, L. Joll, and P. McShane. (1998). A review of the status of echinoderm fisheries in Australia and New Zealand. In, R. Mooi and M. Telford (eds). Echinoderms: San Francisco. Proceedings of the ninth international echinoderm conference San Francisco/California. Balkema Rotterdam. pp. 44. McShane, P. E. (1981). The effect of scallop dredging on the macrobenthos of a muddy environment in Port Phillip Bay. Victorian Ministry for Conservation, Marine Science Laboratories, Technical Report No. 5. McShane, P. E. and M. S. O’Connor (1982). A dredge tow estimate of scallop distribution abundance and size composition in Port Phillip Bay, Victoria, January 1982. Victorian Ministry for Conservation, Marine Science Laboratories, Technical Report No. 9. McShane, P. E. (1982). A comparison of dredge and dive surveys of scallop populations in Port Phillip Bay, Victoria. Victorian Ministry for Conservation, Marine Science Laboratories, Technical Report No. 10. McShane, P. E. (1982). Port Phillip Bay scallop catches likely to be steady this year but down next year. Australian Fisheries 41, 28−30. McShane, P. E. and D. Gwyther (1983). Port Phillip Bay scallop stocks low for 1983 season. Australian Fisheries 42, 61−63. McShane, P. E. (1983). Port Phillip Bay scallop population assessment – January 1983 Victorian Ministry for Conservation, Marine Science Laboratories, Technical Report No. 26. McShane, P. E. and D. Gwyther (1984). Port Phillip Bay scallop population assessment and fishery catch forecast – January 1984. Victorian Ministry for Conservation, Forests and Lands, Marine Science Laboratories, Technical Report No. 35. McShane, P. E. and R. J. G. Lester (1984). The occurrence of a larval nematode in Pecten alba Tate from Port Phillip Bay Victoria. . Victorian Ministry for Conservation, Forests and Lands, Marine Science Laboratories, Technical Report No. 37. Gwyther, D., and P. E. McShane (1984). Port Phillip Bay scallop prediction optimistic – but warning sounded for future. Australian Fisheries 43, 12−14. McShane, P. E. and D. Gwyther (1985). Port Phillip Bay scallop study : good catches this year, problems next year. Australian Fisheries 44,14−16. Gwyther, D. and P. E. McShane (1985). Port Phillip Bay scallop population assessment and catch forecast for the 1985 season. . Victorian Ministry for Conservation, Forests and Lands, Marine Science Laboratories, Technical Report No. 40. Gwyther, D. and P. E. McShane (1988). Growth rate and mortality of the scallop Pecten alba Tate in Port Phillip Bay, Australia, and evidence for changes in growth rate after a 20-year period. Fisheries Research 6, 347−361. Broadhurst, M. K., R. B. Larsen, S. J. Kennelly, and P. E. McShane (1999). Use and success of composite square-mesh codends in reducing bycatch and in improving size-selectivity of prawns in Gulf St. Vincent, South Australia. Fishery Bulletin 97, 434−448. McShane, P. E., S. J. Hall, and N. A. Carrick (1999). Trophic consequences of prawn trawling: linking by-catch to benthos. In Buxton, C. D. and Eayrs, S. E. (eds). Establishing meaningful targets for bycatch reduction in Australian Fisheries. Australian Society for Fish Biology Workshop Proceedings, Hobart, September 1998, pp 106−112. Australian Society for Fish Biology. McShane, P. E. (1999). What are the obstacles to establishing by-catch targets in Australian fisheries? In Buxton, C. D. and Eayrs, S. E. (eds). Establishing meaningful targets for bycatch reduction in Australian Fisheries. Australian Society for Fish Biology Workshop Proceedings, Hobart, September 1998, pp 144−154. Australian Society for Fish Biology. Broadhurst, M.K., P. E. McShane and R. B. Larsen (2000). Effects of twine diameter and a mesh-size increase in the body of prawn trawls used in Gulf St. Vincent, Australia. Fishery Bulletin 98, 463−473. Xiao, Y. and P. E. McShane (2000). Estimation of instantaneous rates of fishing and natural mortalities from mark/recapture and catch and effort data on the western king prawn Penaeus latisulcatus in the Gulf St. Vincent, Australia, by conditional likelihood. Transactions of the American Fisheries Society 129, 1005−1017. Xiao, Y. and P. E. McShane (2000). Use of age- and time-dependent seasonal growth models in analysis of tag/recapture data on the western king prawn Penaeus latisulcatus in the Gulf St. Vincent, Australia. Fisheries Research 49, 85−92. M. Broadhurst and P. McShane (2000). Refining selective prawn trawls in Gulf St. Vincent the effects of increasing mesh size in the trawl body. Professional Fisherman 22 (6), 8−9. Jenq, H. Y., Eayrs, S. and McShane, P. (2004). Account of investigation of fish gear technology and ecological impact. Agricultural Science and Technology 22, 3−10. (in Chinese). McShane, P., and Otway, N. (2004). Technological solutions for marine and coastal industries. In Proceedings of the 2004 International conference on marine science and technology. 13−14 May Kaohsiung, Taiwan. 105−110. Piasente, M., Knuckey, I.A., Eayrs, S., and McShane, P. E. (2004). In situ examination of the behaviour of commercial fish species in response to demersal trawl nets. Marine and Freshwater Research 55, 825−835. Jenq, H, Y, Eayrs, S. and McShane, P. (2005). Marine industry development based on set-net fishery. In Proceedings of Conference on Underwater Techniques. Peoples Republic of China, Kaohsiung, Taiwan, April 15 2005. pp 350−357. Al-Masroori, H. S., Al-Oufi, H. and McShane, P. (2009). Causes and mitigations on trap ghost fishing in Oman: Scientific approach to local fishers perception. Journal of Fisheries and Aquatic Science 4, 129−135. McShane, P. (2002). Supply chain management for commercial fisheries: southern rock lobster. Professional Fisherman 24 (10), 14−15. McShane, P. (2002). Today’s ocean conscious industry: supply chain management of southern rock lobster. Seafood Australia 40, 24−25. McShane, P. (2002). Supply chain management for commercial fisheries: southern rock lobster. Seafood New Zealand 10 (4), 50−53. McShane, P. (2002). Supply chain management for commercial fisheries: southern rock lobster. Fishing Boat World 12 (5), 12−14. McShane, P., R. Edwards and M. Muggleton. (2005). Clean Green leads the world in proactive environmental management. Professional Fisherman. McShane, P., R. Edwards and M. Muggleton. (2005). Proactive environmental management: Clean Green rock lobster presents a fully integrated product management strategy. InfoFish International. 5, 65−68. McShane, P. (1999). Commercial fishing in the new millennium: resource allocation. Professional Fisherman 21 (10), 14−16. McShane, P. (1999). Commercial fishing in the new millennium: resource allocation. Seafood New Zealand 7 (10), 36−37. McShane, P. (1999). Commercial fishing in the new millennium: environmental management. Professional Fisherman 21 (11), 14−15. Gullett, W. and P. McShane (2003). In defence of the precautionary principle. Queensland Fisherman April, 25−27. McShane, P. (2006). Maritime Education and Training: Opportunities and threats in the 21st century. Shipping Australia 25−28. McShane, P. (2016). Sustainable Fisheries Management for Indonesia (2nd Edition). Textbook 137 pp (available from the Author). O’Hara, T., P. E. McShane and M. Norman (1999). Victoria. In N. L. Andrew (ed.). Under Southern Seas: the ecology of Australia’s rocky reefs. Pp. 72−78. UNSW Press, Sydney Pp. 20−30. McDonald, B. and P. McShane (1999). Mission of discovery in our seagrass meadows. Southern Fisheries 6 (1), 38−41. Fitzpatrick, B., Ley, J, and McShane, P. (2006). Habitat heterogeneity of NSW marine protected areas. In Proceedings of the International Coral Reefs Symposium, Okinawa, Japan, 2004. 1483−1498. McShane, P. E., Broadhurst, M. K., and Williams, A. (2007). Keeping watch on the unwatchable: technological solutions for the problems generated by ecosystem based management. Fish and Fisheries 8, 153−161. The Author Professor Paul McShane with Mr Robert McKelleher, First Secretary (Development Cooperation), Australian Embassy Jakarta. Launching the first edition “Sustainable Fisheries Management for Indonesia” 2015 (Port Lincoln, South Australia). 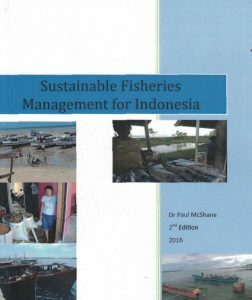 An up to date synopsis of Indonesian fisheries management (137 pp) including relevant case studies. 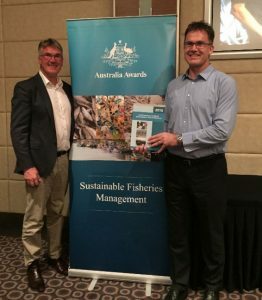 This resource was developed for two Australia Awards Indonesia short courses on “Sustainable Fisheries Management” and was recently updated (2016). A Bahasa Indonesian version will soon be available. Contact the author Professor Paul McShane for copies. 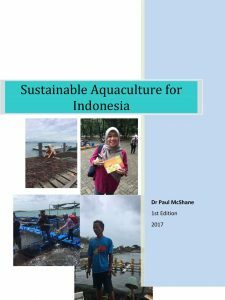 This book provides a practical and contemporary information base for Indonesia’s rapidly growing Aquaculture sector (109 pp.). It was prepared to support a short course on “Sustainable Aquaculture Indonesia” as part of the Australia Awards Indonesia program. A Bahasa Indonesian version will soon be available.